Awareness Programme on "EVM and VVPAT" organises at Govt PG College Rajouri. "Poster Making" competition was also held to display the value of voting. Rajouri:Electoral Literacy Club (ELC) of Govt. P.G. College Rajouri with the collaboration of NCC unit organised an awareness programme on use of EVM and VVPAT which was attended by large number of students and faculty members of the college. The event was presided over by the Principal, Dr.J.A.Qazi.Nodal Officer of ELC, Prof. Amit Bhalla presented welcome address and also highlighted the importance of electoral participation in democratic set up. Officials of District Election Cell made live demonstration on the use of EVM and VVPAT. 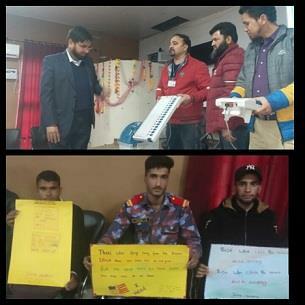 Talking to The News Now, Mr.Tanveer Ahmed, Associate Officer, NCC , PG College Rajouri said that in the programme students displayed various posters which dipicts the importance of one vote in the democratic process. "The NCC students of our college presented different posters which were showing quotes regarding importance of voting", he added.